Agreed! Now if only they'd purchase all the Hammer horror titles and re-release them with anamorphic transfers! Just read on the temporary Fangoria site that Shout Factory is releasing the original Gamera this coming May. Sounds good to me. This will be a must buy. I want a multi-DVD set with the original (Japanese and English dubs), the American Albert Dekker version, and the Sandy Franks version. Gamera is really neat, he is filled with turtle meat. Ah,Mystery Science Theater,I miss that ! They Just scored the rights to MAX HEADROOM!!! Now that Shout! Factory has Gamera and MST3k under the same roof there's been speculation of a release of the Gamera episodes but Cliff says the Gamera rights owners have no interest in that. Sad to say perhaps, but I would think a MST3k Gamera bookset could very well outset the Gamera straight boxset. From what I've read, Sandy Franks was really pissed off by what MST3K did with the films and refuses to renew the rights so that those episodes can be released on DVD. "Shout! Factory has released the edition details for Death Race 2000 , which will come out on Blu-ray on June 22. This movie, the biggest box office hit for a Roger Corman production, is set in a world where the biggest entertainment is the three-day Transcontinental Death Race, whose winner is the driver who racks up the most points by killing innocent bystanders. The Blu-ray has been transferred from the interpositive film element. Playing the Game: Looking Back at "Death Race 2000"
Designing Dystopia! : A detailed look at the film's futuristic landscapes and now-classic race cars with co-art director B.B. Neel, car designer James Powers and car constructor Dean Jeffries. Killer Score: An all-new interview with composer Paul Chihara on the creation of the film's eclectic score, which was also his first feature film composition. Following the release of Death Race 2000, upcoming titles on Blu-ray are Piranha, Starcrash and Battle Beyond the Stars." Wow, now I'm really getting excited! That sounds like it's going to be an awesome Blu-ray. Just got an email from Amazon saying the release date of the Death Sport disc has been pushed back to Aug. 3rd? That was one of the releases I was really looking forward to as I am a big Claudia Jennings fan. Damn...just have to wait a little longer. I got that email today from Amazon also, it looks like the release date has indeed changed. Death Sport? 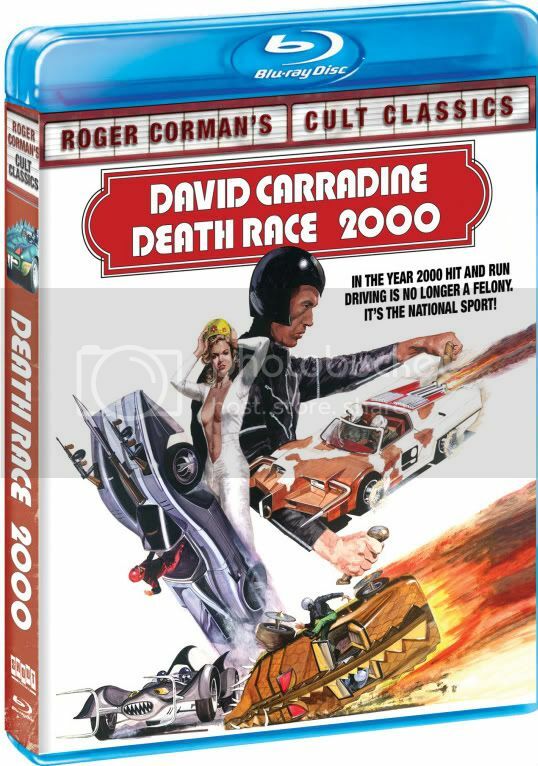 You mean the new Death Race 2000 DVD from Shout! Factory, right? Also, Shocktillyoudrop has reported that the new release will have (and I quote), a "New Anamorphic Widescreen Transfer (1.85:1) in high definition from the inter-positive film element ". EDIT: Never mind, I look at the Amazon page for the Death Sport/ Battle Truck Double Feature (which Chomp was right about it being delayed). Death Race 2000 will still be released in June. Glad I sold my standard dvd of Death Race 2000 when I did. This Blu-Ray will indeed be the definitive release of this cult classic. No. Death Sport is sort of a sequel to Death Race 2000. Nice cover! Glad to see the illustrated poster used as cover art. Are any of these extras ported over from the last special edition of DEATH RACE 2000 ? I used to own that but sold it when the price for it on e-bay was super high. The extras from the last SE will be ported over.